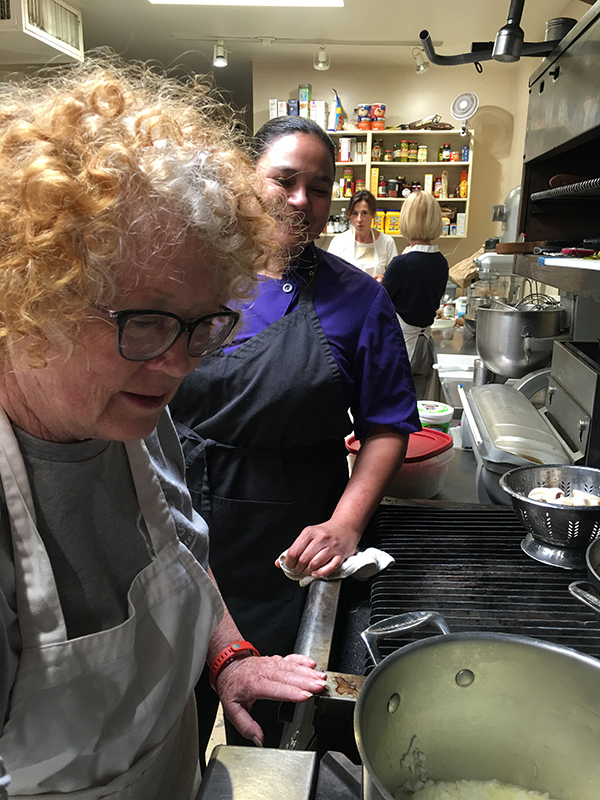 Roberta Armstrong, left, cooks in a commercial kitchen during a lifelong learners course offered by the Doel Reed Center for the Arts in July 2016. They spent a fun-filled week in July 2015 studying "Shamus and Shaman: Tony Hillerman's Dance Hall of the Dead and A Thief of Time," taught by Brewster Fitz, OSU professor emeritus. They had so much fun that they returned last July for "New Mexico Farm to Table," taught by Barbara Forsberg, owner of nearby Brett House Catering. They were among the record 31 participants in four courses that session. They spent time in Forsberg's commercial kitchen honing their cooking skills, visiting with a local farmer at his property, utilizing a wood-fire oven in a beautiful local home, and cooking dishes such as paella and pizza. "During class, we sat outside under a huge willow tree and had great discussions," Roberta said, adding they learned more about who Doel Reed was and bought in to the purpose of the Doel Reed Center for the Arts. "The courses are so well-done," Roberta said. "People ask which course was better, and I just can't say. Everyone we talked to said they wanted to take another one. You have such a good time in these great class sessions, and you also have plenty of time to go do other things while you're out there." "We spent the Wednesday we were out of class floating down the Rio Grande. It was peaceful and fun. You have a lot of opportunities like that," he said. "And then there are some events in the evening when you get together with everyone from all of the classes. It's a great trip." "There are so many classes we want to take," Roberta said. "We both are interested in another cooking class, and another Hillerman class, and a bunch of others that have been offered." Carol Moder, director of the Doel Reed Center for the Arts, said the Armstrongs' experience is typical for those who have taken the lifelong learner courses. "We have found good instructors, both among local experts and OSU faculty," Moder said. "Some participants like more academic-based content, and others like activity-based classes where they get out in the environment in Taos. We are scheduling options for both this summer, and people who would like to participate need to enroll soon to save a spot."